International round ticket from VND 390,000 to 8.19 million will be sold at ITE trade fair. Apart from offering special price for the trade fair, Vietnam Airlines is proud of the airlines advertising image of Vietnam country through sponsoring discount flight ticket for organizations which invite international customers and partners. In this year, the international trade fair Ho Chi Minh city- ITE HCM city will take place from September 11 to September 13 at Saigon Exhibition and Convention Center (SECC), Phu My Hung, district 7, Ho Chi Minh city. The activity is considered a big event of Tourism section and supported by the government of Vietnam. 10th ITE-HCMC carries a new message “5 nations- one destination” as mark of large- scale development of the trade fair during 10 years of organizing. 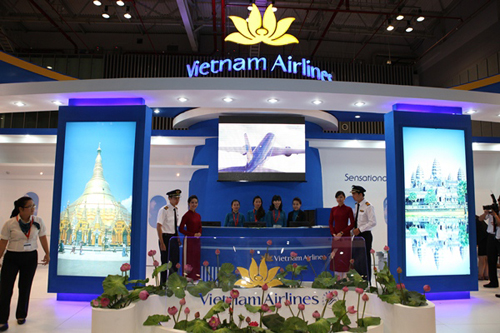 Vietnam Airlines participates in the trade fair as a major air transport in the sub-region Cambodia- Myanmar- Vietnam, as well as a member of HK Skyteam Alliance, the airline has for years always with ITE HCMC Expo. According to leaders of Vietnam Airlines, in this year, the airlines continue to sponsor 150 discount flight tickets for the Expo in order that Department of Culture, Sport and Tourism invite international customers. Vietnam Airlines participates in the trade fair as a major air transport in the sub-region Cambodia- Myanmar- Vietnam, as well as a member of HK Skyteam Alliance, the airline has for years always with ITE HCMC Expo. 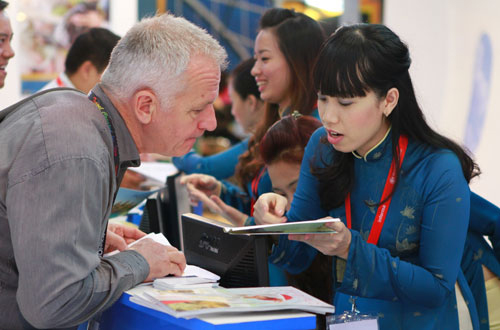 This is the 10th time the airlines attend the fair as an official carrier, in order to contribute to the promotion of Vietnam tourism and bring Vietnam cultures and ethnic identity to world friends.